Dogs are capable of facial expressions, just not as many as humans. 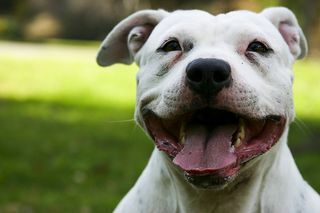 Your dog’s smile might mean that he’s happy to see you and he knows he submissive to you. The submissive grin, where the corners of the mouth are pulled back, indicates subordination or insecurity. It sometimes goes along with a licking motion. Dogs also “smile” when threatened. In this type of smile you can see their teeth, in particular the upper lip is lifted enough to see their canine teeth. How or when does your dog smile?